Well, once again I'd like to thank you for not only watching, but videotaping "Dharma & Greg." 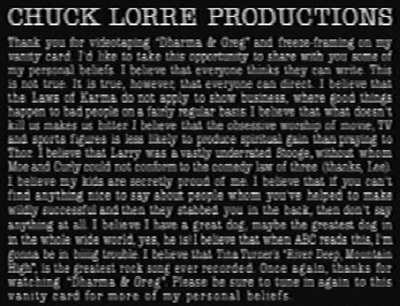 I know you're busy, so this shows a wonderful commitment on your part and I want you to acknowledge that commitment with a big ol' Chuck Lorre vanity card hug. Okay, with that done let's get on with why you're here, to learn more of my personal beliefs. I believe that this episode, which on the surface deals with a funny Valentine's adventure, in fact grapples with the weighty issue of Weltschmerz. Weltschmerz is a German word which loosely means "world suffering deriving from the inevitability of reality to never match up with our expectations." Boy, only the Germans could come up with a word like that. Anyway, in this episode Greg is in Weltschmerz hell as he discovers that life is never quite like the brochure. Dharma, on the other hand, recognizes that life is a flowing river and happiness exists only when one embraces its ever-changing nature. From this dilemma we draw the comedic essence of our story. Finally, I believe that when I retire and teach sitcom writing at a community college, I'll use this theme for one of my classes to impress the kids.